This is the most common cause of headache. Tension creates a spasm of the muscles at the back of the neck. The muscle spasm gets the tissues over the surface of the cranium and thus, the pain is felt not only on in the neck but also on the forehead. Migraine is the abnormality of the nervous system. This strain on the nervous system is caused due to eye strain, shock, stomach disorders etc. Migraine is a chronic disease which needs medical attention. 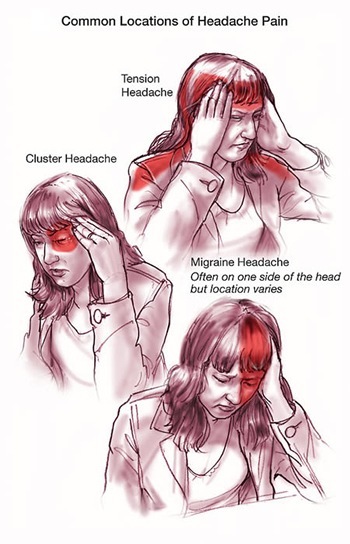 Cluster headaches are repetitive and gets back several times in a month. These are generally caused due to constant pressure on the nerves like alcohol consumption, chain smoking etc. Crush lemon crust into a fine powder and make it into a paste with the use of water. Apply this on the forehead. This is quick relief form headache caused due to tension. Grind watermelon seeds with poppy seeds and consume three grams of it everyday if you are suffering constant pain. Application of sandalwood paste on the forehead is one of the tradition ways of curing headache.